The people queue up to buy bread, while the government raises the price of bread by 35% in December 2017. 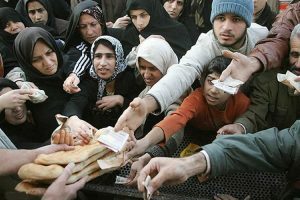 Bread has become the main food for a large portion of the society in Iran, as a result of poverty due to government corruption and dedicating the nation’s resources to fund terrorism and development of nuclear weapons. Iran has a population of more than 80 million people and is the 18th most populous country in the world. It has the second largest landmass in the Middle East. Yet 40% of Iranians currently live below the poverty line, and 90% of the population struggles with poverty in one way or another, from water shortages, lack of access to economic opportunities, unpaid wages, and poor living conditions. In the Middle East and North Africa region (MENA), only Saudi Arabia has a larger economy than Iran, with an estimated Gross Domestic Product (GDP) in 2016 of $412.2 billion. According to an October 2017 report by the World Bank, Iran has the second largest natural gas reserves in the world and the fourth largest crude oil reserve.Dr. 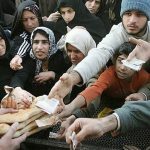 Hossein Raghfar, a professor of Economics at Alzahra University in Tehran told the state-run Iranian Students News Agency (ISNA) in an April 7th interview that a family of four living in an urban area with a monthly income of fewer than forty million rials (approximately $1000) is living in poverty. Iran is the only country in the world that allows its citizens to legally sell their organs. Desperate Iranians sell organs at the dozens of organ supply units spread throughout the country to provide for their families’ basic needs. The regime regulates the practice, with a government foundation set up to register and match buyers and sellers and to set prices on each organ for sale. Some organs fetch higher prices than others, and different prices are given for kidneys, livers, blood, corneas, bone marrow, etc. It is common to find signs attached to walls in the cities of Iran advertising the sale of organs. This is while the criminal mullah’s who are ruling the oil-rich country has dedicated the resources to prop up Assad’s dictatorship in Syria, support terrorism in the region, and to develop nuclear weapon’s program, while a large portion of the country’s income fill’s regime official’s coffers due to vast corruption. Some Iranians are driven to even more desperate measures by poverty. Social media is filled with videos and images of unemployment, suicide, and self-immolation on the streets of Iran. Stories abound of Iranians who have been driven to suicide by poverty. In Abadan, a 12-year-old boy named Maysam hanged himself a day after his mother sold his mobile phone and bike in order to pay the rent on their home. An elderly woman in Varamin, in Tehran Province, threw herself in front of a bulldozer to prevent the destruction of her home by the municipality. ‘proletarianization.’ In essence, poverty has spread so much that the middle class has been pushed into the lower classes. The widespread uprising that began last December started because of dissatisfaction with economic conditions in Iran. Joblessness, poverty, and corruption by the regime led the people to take to the streets, and protests soon turned to cries for regime change. The solution to ending the bizarre economic condition in Iran is to end the corrupt clerical regime, which has caused the current epidemic of widespread poverty through their corruption and looting of the country’s resources.